Livestock play a crucial role in national development in Ethiopia, accounting for 40% of agricultural gross domestic product. With one of the largest dairy cow populations in Africa at 10 million, Ethiopia produces nearly 3 billion litres of milk a year. Rapidly rising incomes have increased demand for dairy products faster than supply, pushing up prices and increasing the importation of powdered milk. Increasing milk yields and the sale of dairy products hold huge potential for the rural population whose livelihoods largely depend on livestock farming. While productivity in the dairy sector has improved in recent years, there are still opportunities for considerable improvements in milk production. Most small-scale dairy farmers have limited access to knowledge and technologies, higher-performing crossbreed cattle, veterinary services or a regular supply of quality animal feed. Their hardy indigenous cattle produce little milk, 1.5 litres a day per cow, up to 20 times less than crossbreeds in industrialized countries. With few connections with input suppliers—feed suppliers, processors and transportation companies etc.—those dairy farmers producing enough milk are often unable to sell it. This reduced supply increases milk prices and decreases consumption. 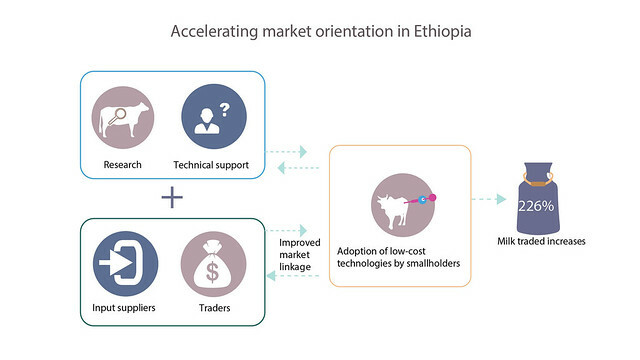 Between 2013 and 2017, the Livestock and Irrigation Value Chains for Ethiopian Smallholders project (LIVES), led by the International Livestock Research Institute (ILRI), identified low-cost technologies, undertook research on their effectiveness and provided support, including the development of training materials and provision of mentoring, to facilitate adoption. LIVES staff established innovation platforms in the Amhara, Oromia, Southern Nations Nationalities and Peoples and Tigray regions of Ethiopia involving more than 1,500 livestock-keeping households and 400 public-sector employees, processors and input suppliers. National researchers, farmers and input suppliers participated in LIVES-led trials; and they in turn demonstrated the new technologies and practices to others to encourage adoption. More than 110,000 smallholder households began producing milk using improved technologies and management practices— better animal housing, feeding and healthcare. For instance, the introduction and adoption of pregnancy testing kits and artificial insemination techniques increased the use of improved cows by 66% to nearly 62,000 animals, while use of milking machines and cow mats to keep the barn clean reduced udder diseases, as well as improving hygiene and food safety. Project partners helped establish and train more than 100 private and cooperative dairy processors and milk sellers. Participants received training and mentoring support on milk quality testing and hygiene, and butter and yoghurt processing, as well as help accessing credit. Following demonstrations of improved production practices, more than 27,000 households set aside approximately 12% of their land holdings and started producing irrigated fodder crops. Over the life of the project, LIVES has contributed to marked increases in dairy productivity and market orientation. In the project intervention zones, the number of households selling milk has increased by 81%, from 17,900 to 32,000, and the volume of milk traded increased by 226%, from 14.6 million litres to 47.6 million litres, a 36% increase in the number of litres sold per cow.